De Javu is my first blog, born in march 2009. 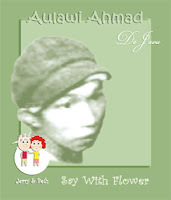 I really love De Javu because I can practice my english language, especially in a poetry forms. I am not a professional poet or expert in English grammar but I always learn to be better day by day. However my side job is an interpreter so always ready to speaking for every one :). And with De javu, all of U can see about my study process or transformation process in sentences, idioms or vocabulary in my poems. In the beginning post of my blog there are several mistake in grammar, or incomplete sentences, etc. Fortunately there are some foreign readers give some correction. Thank you so much for them :). As we know, being a blogger is not only make us learn or share something, but also have a positive benefits in our real life. Happy blogging and success for all of us in the virtual world and in the real world :).